The Law Commission's report on the Civil List has become something of a Trojan horse victory for the Republicans. 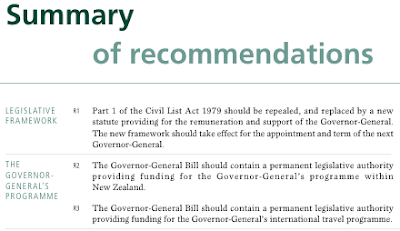 Under the guise of revamping the tax-free status and remuneration of the Governor-General the commission headed by former reformist PM Sir Geoffrey Palmer is recommending the Head of State's representative have their own legislation. Sounds like a complimentary piece of legislation parallel to what Green MP Keith Locke had drawn from the private member's ballot in October: the Head of State Referenda Bill. From the Commission's report: At the moment the G-G must have permission from the PM to do just about anything - including going overseas. The last PM was so controlling she ordered the G-G not to attend at Waitangi on Waitangi Day despite his pleading; so it's not as if they have any freedom domestically either. At the moment the G-G is inside the tight aegis of the PM by way of the legislative gimp jacket of the Constitution Act 1986 and the practical restriction of the office being run from the Department of Prime Minister and Cabinet. The operational budget for the residences, and staff costs, should continue to be funded through vote Prime Minister and Cabinet. The relationship between the PM and the G-G is not being changed from what I've read, but the separate legislation mooted makes it a convenient conduit to advance a republican agenda which can be done by way of amendment later on and be set up through compromises in the bill at committee stage this time round. 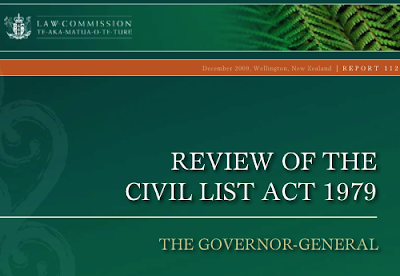 To some though any such interim law amending a colonial office will be seen as pointless as re-arranging the deck chairs on the sinking Titanic as far as Aotearoa constitutional history goes. But philosophy has no immediate influence on the great majority of mankind; it interests only a small number even of the thin upper stratum of intellectuals, while all the rest find it beyond them. In 'contra-distinction' to philosophy, religion is a tremendous force, which exerts its power over the strongest emotions of human beings. As we know, at one time it included everything that played any part in the mental life of mankind, that it took the place of science, when as yet science hardly existed, and that it built up a Weltanschauung of incomparable consistency and coherence which, although it has been severely shaken, has lasted to this day.